(Phys.org)—Scientists have developed a method for imprinting tiny yet complex 3-D structures on the tip of an optical fiber, whose 125-µm diameter is roughly the thickness of a human hair. The 3-D optical structures can manipulate the light's properties, such as its phase and wavefront, which enables a variety of integrated optics applications including laser machining, lab-on-a-fiber, and biomedical sensors. One of the biggest advantages of the new nanoimprinting method is that it is much less expensive than previous fabrication methods, opening the doors to more widespread use. The researchers, Giuseppe Calafiore, Alexander Koshelev, and coauthors at aBeam Technologies Inc., the University of California at Berkeley, and the Molecular Foundry at Lawrence Berkeley National Lab, have published a paper on the new nanoimprinting method in a recent issue of Nanotechnology. "The development of this new technology offers many advantages in terms of reproducibility, flexibility in the design of optical structures, as well as cost," coauthor Keiko Munechika at aBeam Technologies told Phys.org. "Furthermore, this technology enables fabrication of complex optical structures comprised of material that has a high refractive index directly onto a fiber. This opens up a whole new range of fiber probes and devices, including optical tweezers and other immersion applications where other types of fiber lenses do not work." Although there are many ways to integrate optical components with optical fibers, the bottleneck of this integration is the nanofabrication of 3-D optical components directly onto the ends of the fibers. The challenge is mainly the small surface area, since most fabrication techniques are designed for larger scales. 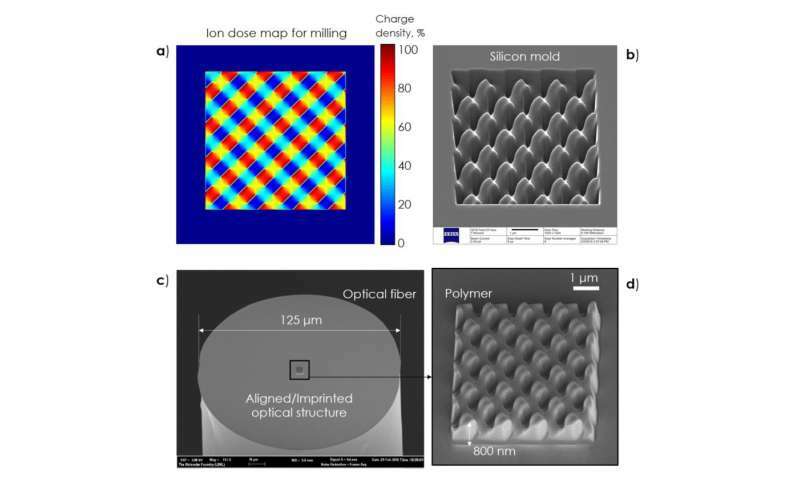 Currently, fabrication of optical components on a fiber involves expensive and time-consuming techniques such as electron beam lithography or focused ion-beam milling, which has limited the development and widespread use of optical devices integrated on a fiber. The new method developed here uses ultraviolet nanoimprint lithography to print complex 3-D patterns on the end of an optical fiber. To demonstrate, the researchers fabricated a convoluted 3-D beam splitter that splits light into four beams of equal intensity upon exiting the fiber. Fabricating the beam splitter requires milling 255 different height levels on a 5 x 5 µm2 structure, demonstrating the high resolution and precision of the lithographic technique. As far as the researchers know, this is the highest lithographic accuracy achieved to date for imprinting complex 3-D features on the end of an optical fiber. The process can be used to imprint many other types of 3-D components that manipulate light in various ways, and do so at a high throughput and low cost. "There are many potential applications, ranging from bio sensors, and optical trapping to telecommunications," Munechika said. "There are some conventional applications, in which bulky, expensive and difficult-to-align optics can be instead integrated on a fiber. One such example is a vortex phase mask that produces beams that carry angular momentum. It is used in STED (stimulated emission depletion) microscopy and telecommunications. Integrating it on a fiber simply makes it much easier to use and reduces cost at the same time. There are also more elaborate applications that open up new opportunities, rather than just improving existing devices. Examples include efficient near-field optical probes, fiber lenses for optical trapping, and different kinds of chemical sensors." In the future, the researchers plan to develop technology to scale up the fabrication and work to commercialize the fiber probes. More information can be found at www.fiberphotonics.com.